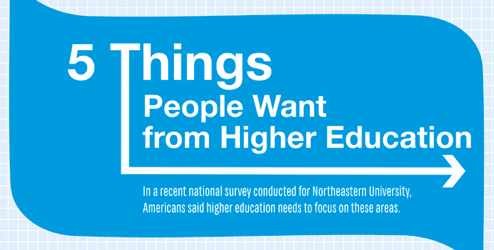 What people want include global study/work opportunities, entrepreneurship, integration of professional work opportunities, hybrid courses, and lower cost. It is not only a wake-up call for higher education, but also for our K-12 system, particularly at the high school level. 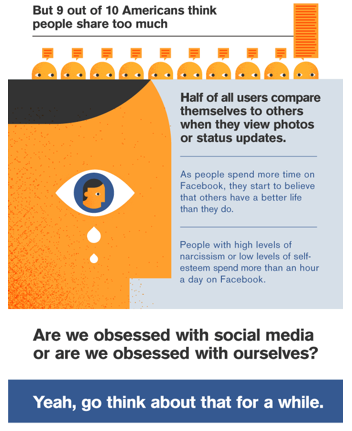 The infographic, The Psychology of Social Networking from Psychology Degree, breaks down the world of social media and shows how much it is an integral part of people’s lives. It seems we love talking about ourselves, even though nine out of ten people think we share too much. According to this graphic, when we reveal information about our own lives, it activates the part of the brain associated with satisfaction. The numbers are staggering, and perhaps they should give us pause to think about how they affect the students we teach. From status updates, tweets, and adding friends, it seems Americans spend one out of every five minutes online using social media. 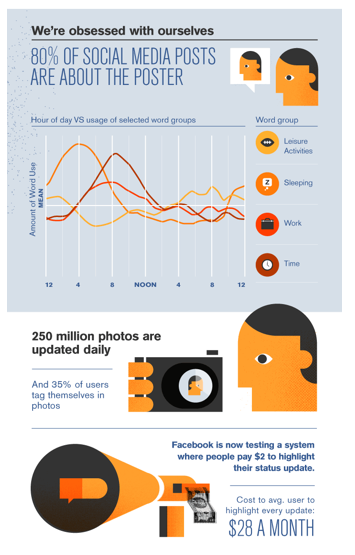 Who knew that over 250 million photos are updated daily, or that 35% of people tag themselves in pictures? In other words, they become searchable. Yet how many schools actually teach students, or adults for that matter, what tagging means? 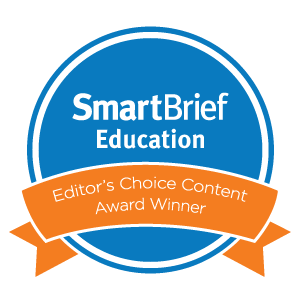 There’s a tech lesson here, and it’s not just for students. Teachers need to know just how much social media plays into the lives of our current generation of kids. If we want to encourage digital citizenship and understand their world of social media, we should take note of the details in this infographic. 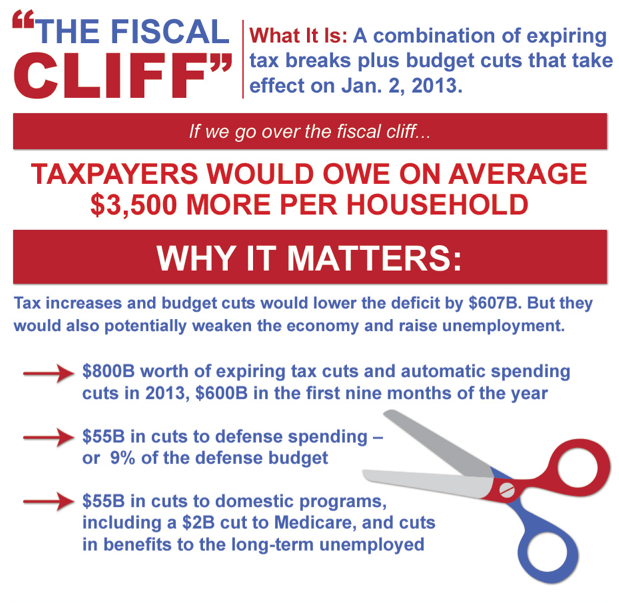 So what do the Mayan calendar and the Fiscal Cliff have in common? Perhaps nothing more than counting down the end of days for the world or allowing taxes as we know them to increase. There's certainly no shortage of information in the media, and it seems hard to avoid talking about these "events" with our students. The presidential election was no sooner over in November than we started heading for the precipice. Judging from the current state of affairs in Washington, we just might fall. Nevertheless, we are always looking for ways to keep our students engaged as we approach the holiday break, and there are plenty of dynamic infographics available. Here are some of our favorites that we've shared with our students, and as always, they can be used in a variety of disciplines. 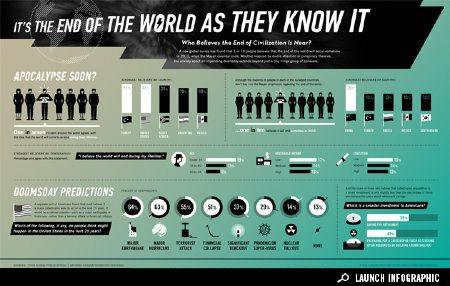 It's the End of the World As They Know It from Good.is has some interesting statistics regarding countries that believe the apocalypse is coming and the dire predictions of how it will happen. Another is the visualization called Countdown To 2012 from KarBel Multimedia. 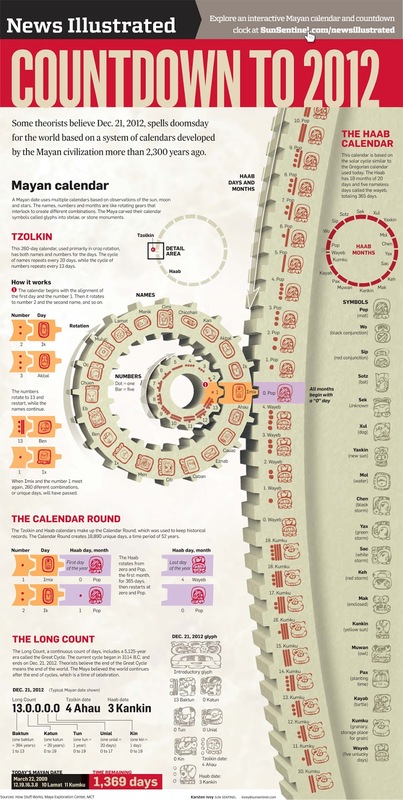 This design shows the ticking away to the end as gears inside a clock. 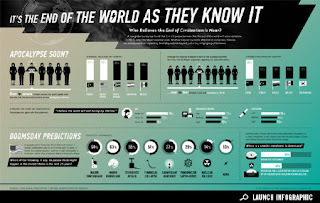 There are others, such as the End of the World or the believers and skeptics infographic, which parallels the views from both sides about the prophecy, celestial significance, cataclysm, and consciousness shift. 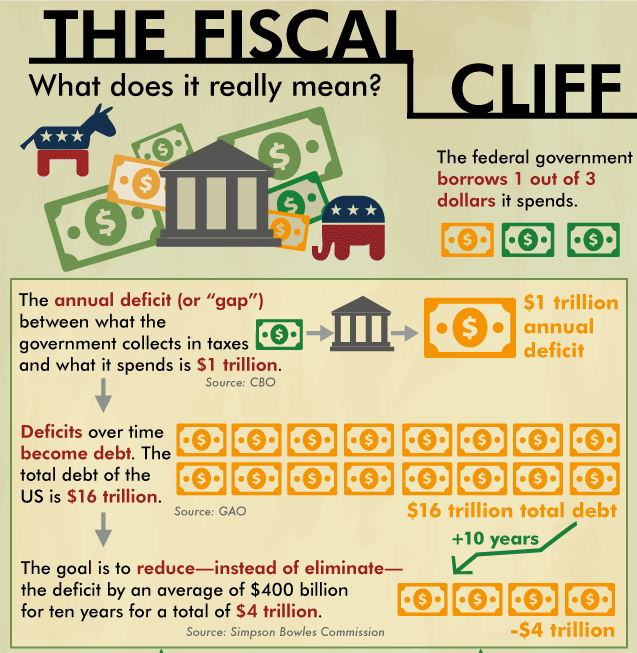 As for Fiscal Cliff infographics, there are plenty that do a nice job of showing the two sides of the issue, both on the tax increases as well as on the political points of view. 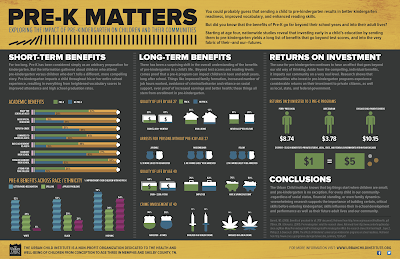 Any of these visualizations make for great discussions about economics, finance, and politics. It's hard not to see how they would fit into any social studies class. 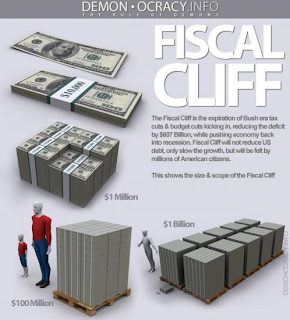 One particularly interesting visual is The Fiscal Cliff - 2013 - Cheat Sheet by Demon-Ocracy Info that uses mounds of $100 dollar bills to illustrate the financial situation. It also produced the following powerful, animated video using the same concept of using $100 dollar bills to visualize debt in the United States. 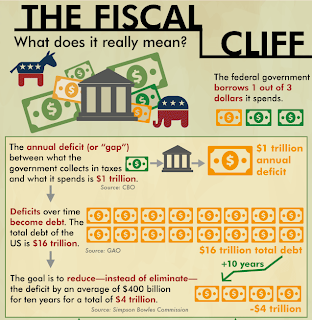 A few others include the infographic from ABC News, incorporating the red and blue color scheme to highlight the political affiliation, and The Fiscal Cliff: What Does It Really Mean?, showing a different representation of the information. 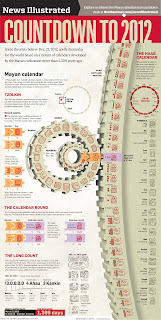 In all of these designs, it's important to carefully dissect the details. One of the things we do with our students whenever we use visualizations is to compare the data and information for discrepancies. 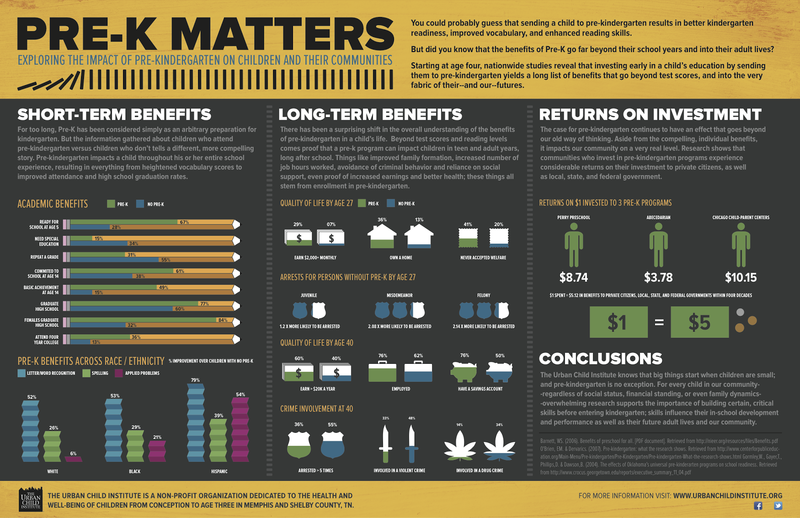 A key component in our curriculum is media literacy, and it's important always to include the core concepts of media literacy whenever students are looking at infographics to check for possible biases or misinformation. 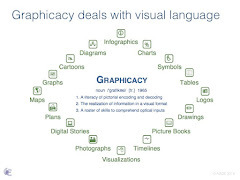 In addition, we continually want to reinforce the skills of graphicacy to build our students' abilities to be visually literate and to be visual thinkers. So much of what they see depends on a solid foundation in these areas. As K-8 teachers, we are heartbroken about the tragedy in Newtown, Connecticut. Our thoughts and prayers are with the entire community. It's difficult as teachers to fathom such a heinous act against children so young, especially as we walked passed our own first graders on Monday morning. Today, building the seeds of empathy seems more important than ever before, and we need to reinforce it as much as we can in our classrooms. Although we want to know why this individual did this, we appreciate the news focus on the victims and the families who lost love ones, rather than on the perpetrator. It, nevertheless, begs the question -- why so many guns? And how many more shootings before we realize there is a problem with this country's obsession? We've gathered a collection of resources in this post to point out just how much of an impact guns have on our society. We'd be wise to share this information with our students, at least from the middle school on up, to bring about awareness of a growing trend. The number of mass killings in just the last two years should not be accepted as routine, nor be made easy for lack of compromise in legislation. Perhaps, just perhaps, we could start to bring attention to the over-proliferation of guns in America. 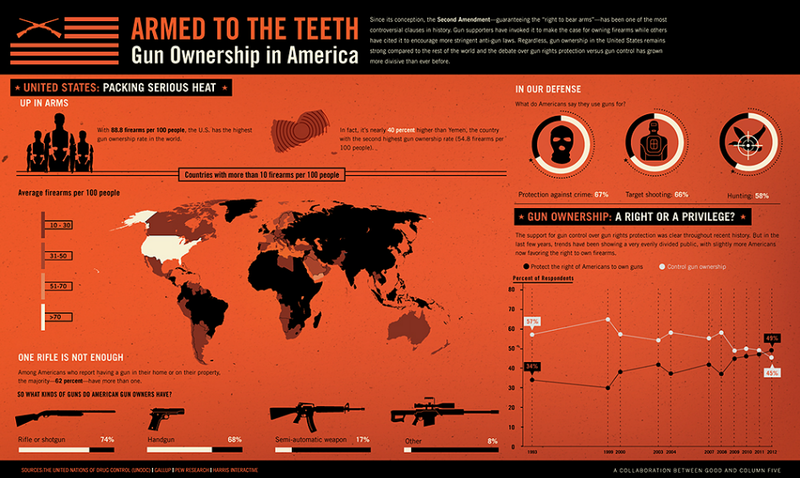 According to the infographic Armed To the Teeth, there are 88.8 guns per every 100 people in the United States, and 62% of the population that owns a gun has more than one. 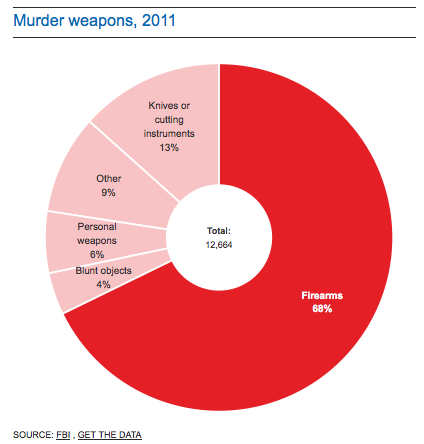 Of those firearms, 17% are semi-automatic assault weapons. 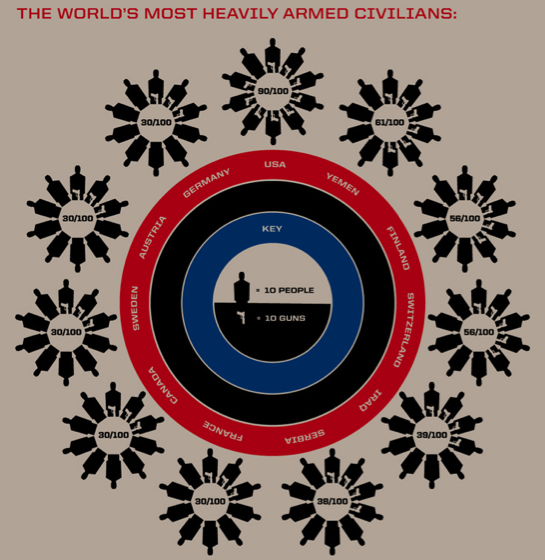 Another powerful infographic is Where Are the World's Small Arms?. This visualization makes clear that the spread of guns is not about the right to bear arms, but due instead to a billion dollar business. Just take a look at the stats. The world's firearms economy is a multi-billion dollar industry, with $10.3 billion in the United States alone. Of the 8 million new guns produced each year, 4.5 million are purchased by consumers in this country. So what can we do to teach our students about the dangers of firearms, especially when 68% of the 12,664 murders in 2011 in this country were committed by firearms? We would hate to think it's a losing battle to try. If there were ever a need for education and a hard look at gun policies, it's now. When President Barack Obama spoke at the memorial service on Sunday night in Newtown, he asked, "Can we say that we're truly doing enough to give all the children of this country the chance they deserve to live out their lives in happiness and with purpose?" Judging from the data, the answer is no. Gun laws vary from state to state. The Stand Your Ground Gun Laws is an interactive map demonstrating just how varied these laws are across the country. 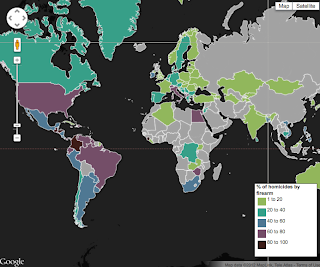 For more data on the percentages surrounding this topic, visit The Guardian's interactive maps of "gun ownership and gun homicides murder map of the world," "gun homicides and gun ownership listed by country," and "US Gun Crime Map." The United States is ranked among the highest when compared to other countries. As we headed back into our classrooms yesterday, we did so with heavy hearts. We could not help but think about our fellow teachers who so heroically tried to shield the children, and we are sure that every parent in America was a little uneasy dropping their child off at school, or putting them on a school bus. We need to do more as educators to find ways within our reach to build tolerance among students and stop the violence. Just maybe, they won't think that they'll need to own a gun. If your school is like ours, you might have a small percentage of teachers who have Twitter accounts and even fewer who actively use them either to lurk or participate. 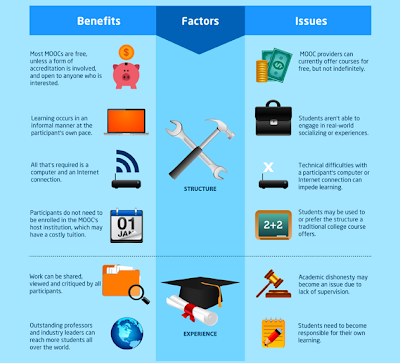 MOOC stands for Massive Open Online Courses. They are rapidly growing in number. They are fed not only by the cost of higher education, but also by the variety of classes, the flexibility in schedule, and the notoriety of institutions that offer them for free. MIT and Harvard partnered to create edX. Coursera is another that offers free online courses, which several top universities partnered together to create. Other big names in the MOOC world are Udemy, Udacity and Khan Academy. The World of Massive Open Online Courses infographic from OnlineColleges provides a detailed breakdown of a MOOC, including their success, popularity, benefits, and issues. In addition, we liked this video we recently found that describes what a MOOC is using simple animation. It would be good to show at any faculty or professional development meeting. One potential victim of January's fiscal cliff is Head Start, the early education program for children from low income families. 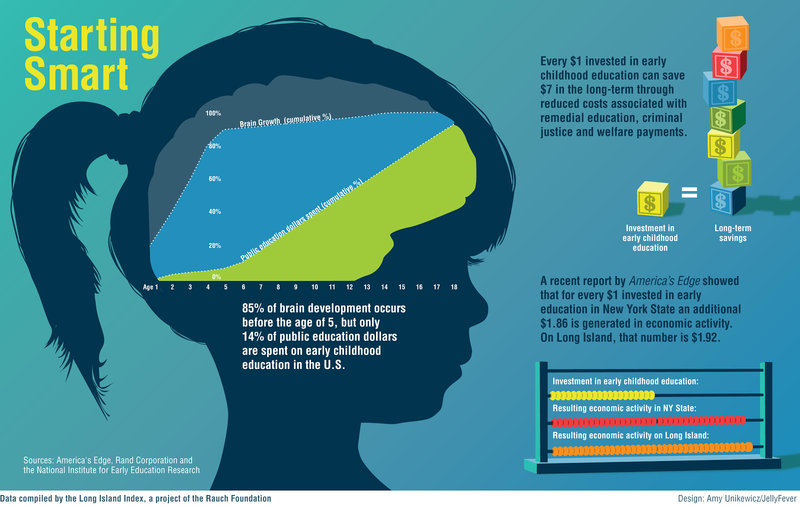 Rarely mentioned in the budget debates are the $590 million dollars that Head Start could lose in federal funding. Our school here in New York maintains a relationship with two area Head Start programs. Each December, our students visit the centers to play games and sing holiday songs. Our middle-schoolers build toys in the wood shop, bake gingerbread cookies, hand-print wrapping paper, and stuff envelopes with crafts to spend the day with classes of 3-to-5-year-olds. Our students come back with lively stories, but even more so, they come back with a recognition of the disparate nature of "school." It's not just the physical differences between buildings, but it's also the realization of space and resources -- and the critical significance of early education. Head Start began as an initiative from President Lyndon Johnson's War On Poverty. It has grown through sequentially updated federal grants overseen by the Administration for Children and Families in the Department of Health and Human Services. 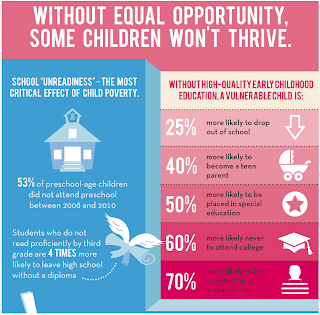 Head Start programs annually reach one million children in inner-city or rural areas. Head Start's crucial mission is to promote school readiness and social and cognitive development through a host of early childhood services. 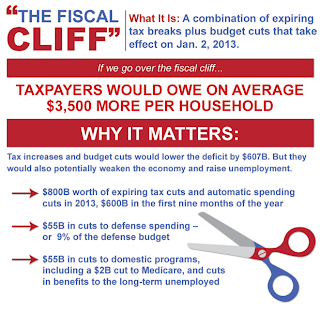 Startlingly, though, several recent Congressional budget proposals have slashed its funding. The risk of the fiscal cliff also holds drastic implications for tens of thousands of children who would lose their access and their teachers. Some voices still argue whether the cost of high-quality early education is worth the financial trade-off. Other advocates for homeschooling declare that preschool exposes children to inconsistent discipline and undermines the parent-child bond. A recent New York Times column from Nicholas D. Kristof even explores the extent to which Appalachian families may intentionally avoid early schooling in order to keep their children illiterate and, therefore, receive government disability checks. 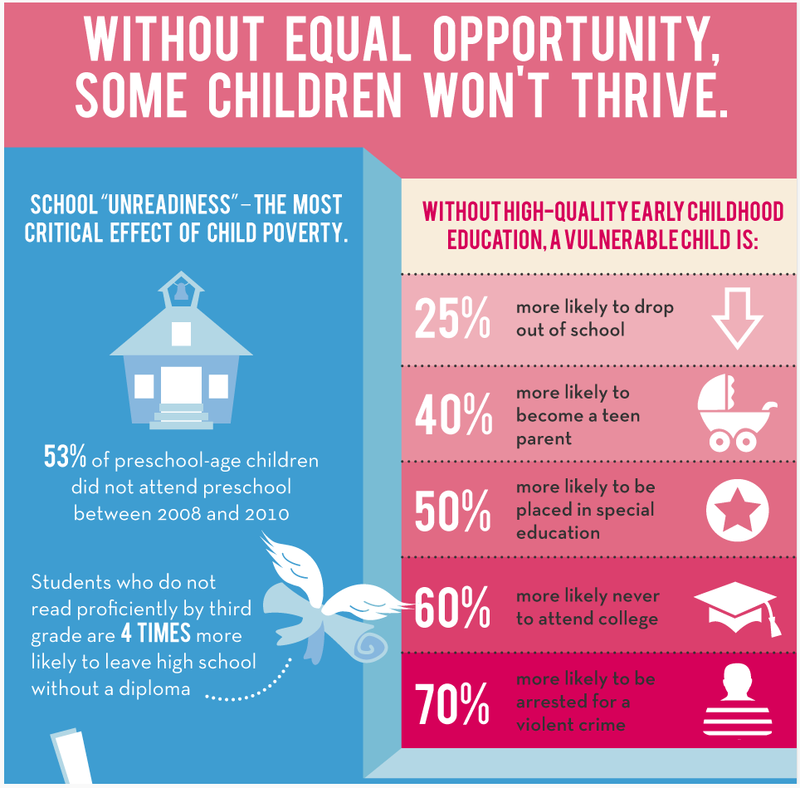 Most educators, however, agree that early childhood education is more vital now than ever. The dynamic world of social interactions and linguistic guidance means that children can thrive under the stewardship of an experienced teacher. A well-intentioned dialogue does exist about the proper balance between play and academics in the early grades. Most agree, however, that the best teachers bring an invaluable toolkit of imaginative educational ideas to inspire young minds and aid in the joy of discovery. 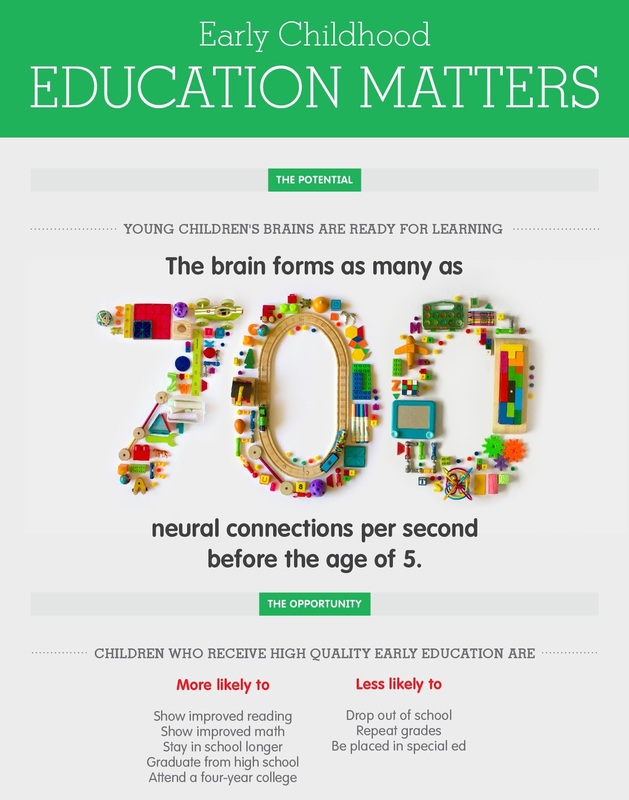 Here we've gathered a collection of infographics that sum up the current state of early learning. 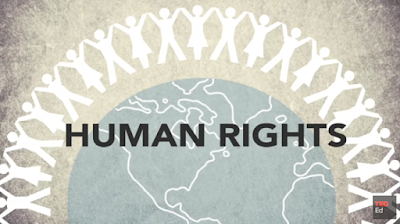 Also, check out this video by designer Alena 'Ash' Heath for First Five Years Fund, an organization dedicated to achieving "better results in education, health, and economic productivity through investments in quality early childhood education for disadvantaged children from birth to age five." The organization even has a customizable toolkit to engage local media and Congresspeople in expressing support for early education up against the financial cliff. 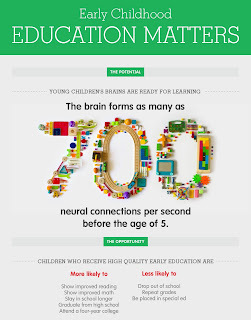 Early Learning Matters from Alena 'Ash' Heath on Vimeo. As we approach the end of another year that seemed to go by in the blink of an eye, the heaviness of world events both near and far looms over us. We face the dire prediction of falling off a cliff because our legislators have failed to compromise much, if at all, over the last four years. For some reason, we are bombarded every day with the prospect that if automated tax hikes and spending cuts go into effect, doomsday is around the corner. Add in the end of the Mayan calendar just before we plunge off the cliff, and we have one heck of a December to deal with before we say "Happy" New Year. Of course, these two predictions do not account for all the other ills going on in the world, such as American troops still fighting a war in Afghanistan, or the sudden change from building a democracy in Egypt to the new leader Mohammed Morsi instituting absolute authority with unrestricted powers. More locally, many communities ravaged by "Super Storm Sandy" are still without the basic necessities of water, heat, and shelter for over a month. We can't help but wonder, where are the common refrains "Peace on Earth" and "Joy to the World" so often printed on holiday cards? Well, for one, they are in our students. With so much swirling around them in their click-and-swipe world, we often overlook the necessity to help them make things that touch the hearts of others. They truly have a genuine interest in current events, and they want to understand the world that to adults seems so negative. This year, we're trying to give them occasions to do just that, and our efforts are paying off in seeing them willingly volunteer to help in their free time. We don't call it community service; we just want them to give willingly to whatever cause they wish to help. Surprisingly, we have no shortage and plenty of repeat participants. It's about planting the seeds of service. By giving them opportunities to contribute and feel empathy, we can build character and self-confidence in knowing that they can make a difference. This fall they finished our memorial that launched our Pencils for Peace initiative by hanging one pencil for every soldier who gave his or her life in the war in Afghanistan. It was truly inspirational to see so many young people wanting to take part in the project. For Veterans Day, the students worked to create a map of the United States the size of a softball field. They added a peace sign, "USA," and the words "Thank You" in huge letters. They then lined the field with flags to guide other students who helped plant 2000 flags to honor the veterans who served our country. To our surprise, or perhaps by a stroke of luck, when they turned to face the school photographer, the image appeared to form a heart around the map. The power and emotion felt by teachers and students were beyond words. As with so much of what we write about, this picture is worth a 1000 of them. 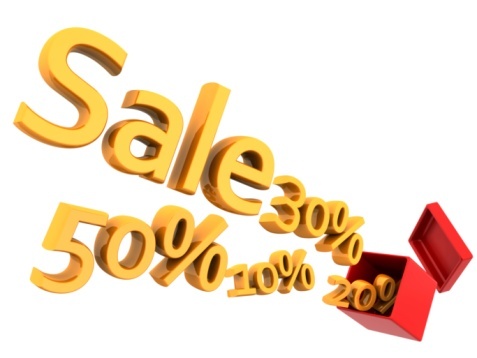 The December spirit of holiday consumerism is once again festooning the airwaves. Storefronts are trumpeting their gift-giving slogans, and email inboxes are overflowing with tantalizing discounts. The current branding bounty makes an interesting sibling to November's election season. One month ago, presidential advertisements waged a similarly irrepressible campaign for our dollars and our votes. One of the most fascinating projects we've come across in a long time is designer Meg Jannott's personal challenge to imagine a unique brand and logo for each of the nation's 44 presidents. In "Branding The U.S. Presidents," she assembles a surprisingly diverse portfolio of altered graphics and signature fonts. Aside from their visual appeal, her images are great companions to any study of leadership or American history. Her eye for balance in layout and text offers an equally valuable lesson for artists of all ages. Students are accustomed to examining reference or thematic maps, but designer and illustrator Jared Fanning has created a cultural map somewhere in between the standard geographic expectations. Fanning takes advantage of what Geography and Earth Sciences Professor Rob Edsall calls "cartographic silences." He deliberately leaves out the standard political boundaries of states and replaces them with patterns of football fandom. 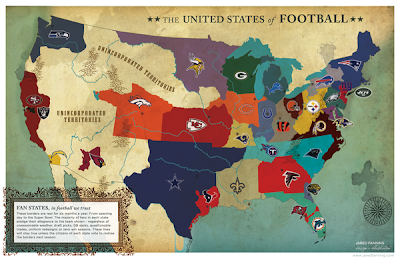 In "The United States Of Football," Fanning paints the regional loyalty of teams, complete with "unincorporated territories" for the lands neglected by the NFL's marketing squad. Fanning's map is a great tool for teaching media saturation, financial literacy, and sports branding. 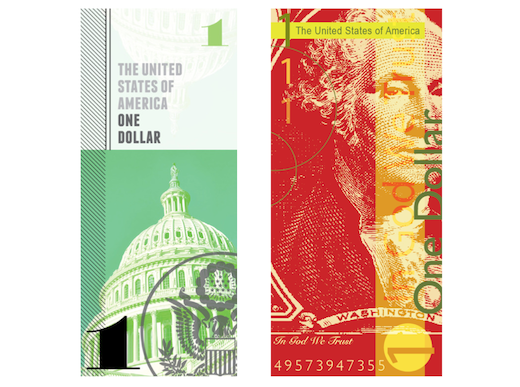 Compared to many other nations' currencies, the United States dollar is relatively bland. Creative strategy consultant Richard Smith thinks "it's time to rebrand the buck." He has sponsored the Dollar ReDe$ign Project, a yearly competition to reimagine the stale green notes. Smith has collected a stunning array of innovative designs, which he hopes will renew faith in America's economy. We definitely encourage you to check out all of the entries on his site, to appreciate the full scope of his project and the fresh range of monetary blueprints. For students, it's also a tour of eminent Americans who might well deserve a place on a banknote. 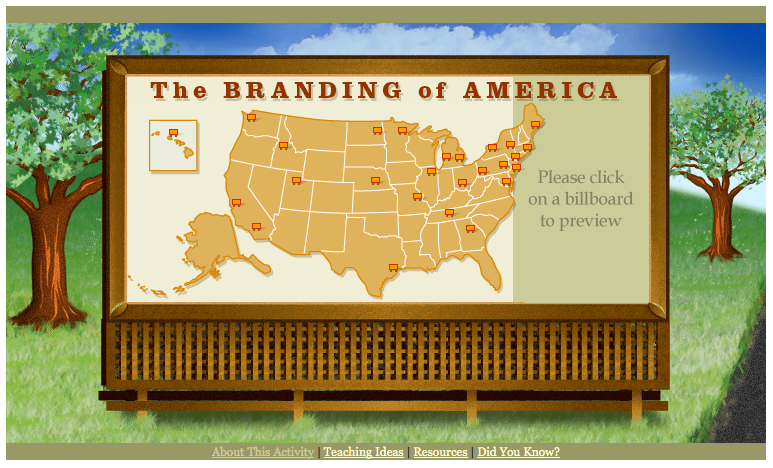 The Library Of Congress has produced a helpful site to let students explore the history of American brands. The product map and teaching resources at "The Branding Of America" explore the entrepreneurial minds and iconic products that have impressed their mark upon the consumer nation. It is a good site for teaching media literacy, as well as a fond trove of American nostalgia. 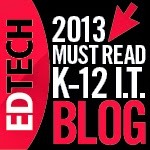 Check out the Innovation Design in Education paper.li newsletter, published daily. Copyright by ASIDE. All rights reserved 2011. Powered by Blogger.